An ever-growing group of scientists seeks to integrate rock deformation labs from across the United States into one shared national facility. Imagine the scientific potential that could be unlocked if researchers with novel ideas could be matched with laboratories with cutting-edge technology. A new program promises to do that for the field of rock deformation research. In fact, such collaborations are already under way. For example, after years of development, geoscience students at Texas A&M University are making the first direct observations of flash heating on frictional rock surfaces sliding at seismic rates using a prototype instrument in the John W. Handin Laboratory for Experimental Rock Deformation. These data are leading to a better understanding of the microphysics of friction and to an improvement of friction constitutive relations used in numerical modeling of earthquake rupture dynamics and strong ground motion. Developing new instruments for testing the physical properties of geomaterials is key to scientific advances, and similar instrument development and learning experiences are occurring in other rock deformation laboratories throughout the world. Unfortunately, many such instruments are rarely produced beyond the prototype because of limited resources and the relatively small number of rock deformation laboratories. What’s more, experimental, observational, and theoretical studies are not often integrated, as each approach requires a unique set of methods, preparation, and specialization. How do we solve these problems? To foster new integrated research of tectonically significant processes, experimental scientists, field researchers, and modelers need shared access to working laboratories and technical support. A new group, born from discussions at meetings and workshops [Tullis et al., 2013], aims to facilitate this access. Called the Deformation Experimentation at the Frontier of Rock and Mineral research (DEFORM), the group seeks to integrate rock deformation labs from across the United States into one shared national facility with access to visiting scientists and students. Scientists who study deformation in laboratory experiments are interested in the mechanical behavior and physical properties of rocks, taking the same approach as materials scientists who investigate properties of metals and structural materials for engineering purposes. In the Earth, these properties govern tectonic responses to geodynamic loads; the rates of plate tectonics; and the catastrophic rupture, episodic slip, and creep on faults. Experimental studies of fracture, friction, and flow of rocks provide failure and slip criteria, rate laws, and understanding of deformation fabrics, microstructures, and mechanisms that can be applied to Earth. They provide key insights into Earth’s tectonics and fault zone processes on a testable scale. For example, data collected in the lab are often used as input into numerical models of geodynamic and fault processes. Experimentally generated deformation microstructures and textures are also compared to those of naturally deformed rocks, fault gouge, cataclasites, and mylonites. However, since the early studies of Griggs [1936, 1940], Brace , and Handin et al. , the development of rock deformation facilities in U.S. academic institutions has not kept pace with scientific needs or technical challenges faced by experimental scientists. With the exception of a few remarkable new deformation apparatuses, early prototype apparatuses have not been replaced by a new generation of advanced instruments. With limited access to experimental facilities, feedback between experimental, theoretical, and observational approaches is restricted, and priority lab experiments are not always defined by theory or field studies. For example, numerical modelers cannot easily test predictions of their new theories of coseismic weakening of rock materials that can also creep under tectonic loading through experiments. There is little opportunity for a structural geologist to test hypotheses of the origin of frictional melting observed in a natural fault zone through laboratory experiments that isolate conditions of melt generation. What’s more, in the case of experimental studies of deformation, laboratories with one-of-a-kind equipment, designed and built in house, and uniquely qualified technical staff are not available to the broader range of geoscientists. But shouldn’t and couldn’t they be? To address these issues, DEFORM hopes to connect individual laboratories to form a conglomerated shared facility with greater access for multidisciplinary research. Collaboration of experimental geoscientists will lead to greater access to a broad community, improved calibrations, uniform procedures, and a new generation of deformation apparatuses. Access to participating laboratories by students of theoreticians and observational scientists will lead to a new generation of interdisciplinary scientists. The vision of DEFORM is that through this shared conglomerate, scientists will work together to enhance communication and technology exchange within the rock mechanics community, provide facilities for early-career scientists, and promote broader collaboration across geophysics, geology, and engineering. DEFORM hopes to host schools and tutorials and directed research meetings that facilitate new collaborations, as well as instrument development workshops focused on improved designs, protocols, and experimental instrumentation. Community design efforts will involve experimental geoscientists who define the technical needs for new instrumentation and consulting professional engineers who design new apparatuses using the latest performance modeling. All of the designs generated by DEFORM will be open source, and they may form the basis to build new apparatuses and fund major research instrumentation grants. DEFORM is modeled, in part, after the successful research consortia Consortium for Materials Properties Research in Earth Sciences (COMPRES), Incorporated Research Institutions for Seismology (IRIS), Southern California Earthquake Center (SCEC), and University NAVSTAR Consortium (UNAVCO), which have revolutionized the fields of high-pressure mineral physics, seismology, earthquake science, and geodesy. DEFORM already has 77 member institutions from university and governmental institutions, including 26 international members. Most members include scientists who have applied experimental results in their own research but have no experimental facilities and welcome greater integration and feedback between experimental measurements of rock properties, geodynamics, seismology, and structural geology. Experimental facilities consist of 15 participating rock deformation laboratories (see Table 1). These labs, plus any more that join, will form the collaborative national facility, operated by participating lab managers with oversight by DEFORM leadership. New members and experimental facilities are welcome (contact Andreas Kronenberg). The primary objective of DEFORM is to increase collaborative observational, theoretical, and experimental approaches to answer fundamental questions in geodynamics, seismology, earthquake source physics, geodesy, structural geology, hydrology, sedimentology, and planetary dynamics. To this end, we seek scientists who wish to undertake multidisciplinary approaches to studies such as the following. Lithosphere Dynamics and Mantle Flow. This approach seeks to examine, for example, mechanical properties that govern plate-like behavior of the lithosphere, the transition to flow in the asthenosphere, rates and patterns of isostatic adjustment to glacial unloading and sea level change, the depth dependence of earthquakes, and seismic anisotropy associated with shear and deformation fabrics. Earthquake Physics and Stability of Slip on Faults. Studies here include the spectrum of fault slip behaviors, mechanics of nucleation, triggering, dynamic weakening, rupture propagation, postseismic slip, aftershock decay, interseismic creep, and episodic slip. Coupled Crustal Deformation and Fluid Flow. These studies have applications to the mechanics of accretionary prisms, coupled fault motion and fluid transport, unconventional energy and resource management, isolation of chemical and radioactive wastes, carbon dioxide sequestration, and induced seismicity. Glacier and Planetary Ice Dynamics. This approach scrutinizes the mechanics of glacial thinning, intraglacial meltwater transport, changes in basal boundary conditions and viscous resistance, loss of ice shelves in response to climate change, and the thermomechanical evolution and tectonics of icy satellites of the outer solar system. By welcoming visiting scientists into existing rock deformation laboratories distributed across the United States, DEFORM hopes to support both the careers of young experimental geoscientists who may ultimately plan to build their own labs and the broader group of geoscientists at all career stages who want to use the shared DEFORM facilities. Opportunities go beyond collaboration: DEFORM hopes to host meetings, workshops, and summer schools for students and postdocs. 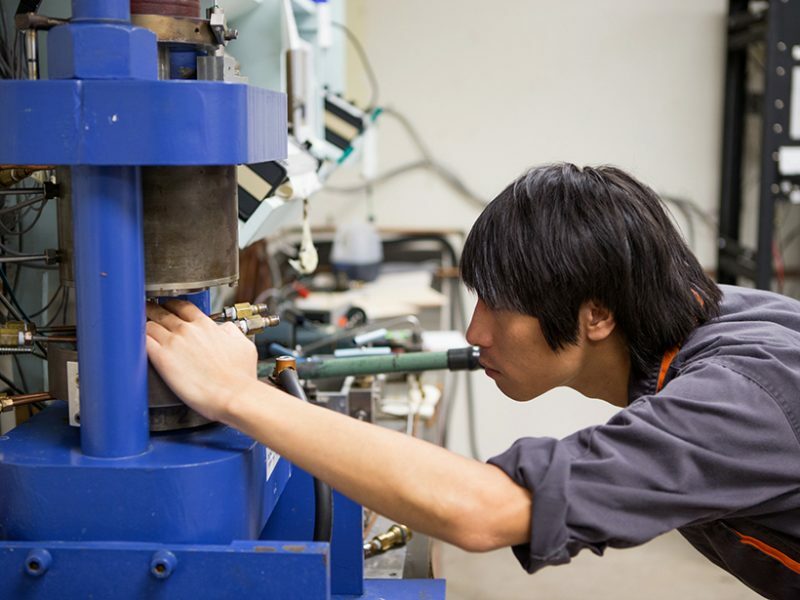 We strongly feel that access to shared laboratory facilities, under the DEFORM initiative, will benefit students and early-career geoscientists and help a new generation take multidisciplinary approaches in the mechanics of plate tectonics and earthquakes. Let the collaborations begin! Brace, W. F. (1960), An extension of the Griffith theory of fracture to rocks, J. Geophys. Res., 65, 3477–3480. Griggs, D. T. (1936), Deformation of rocks under high confining pressures: I. Experiments at room temperature, J. Geol., 44, 541–577. Griggs, D. T. (1940), Experimental flow of rocks under conditions favoring recrystallization, Geol. Soc. Am. Bull., 51, 1001–1022. Handin, J., et al. (1963), Experimental deformation of sedimentary rocks under confining pressure: Pore pressure tests, Am. Assoc. Pet. Geol. Bull., 47, 717–755. Tullis, T. E., et al. (2013), Advancing experimental rock deformation research: Scientific, personnel, and technical needs, white paper, 85 pp., Div. of Earth Sci., Natl. Sci. Found., http://espm.wustl.edu/files/2016/11/Tullis-et-al-2012-Experimental-Rock-Deformation-23yyaqp.pdf. —A. Kronenberg (email: kronenberg@geo.tamu.edu), Center for Tectonophysics, Department of Geology and Geophysics, Texas A&M University, College Station; G. Hirth, Department of Earth, Environment and Planetary Sciences, Brown University, Providence, R.I.; N. Lapusta, Seismological Laboratory and Department of Mechanical and Civil Engineering, California Institute of Technology, Pasadena; J. Chester, Center for Tectonophysics, Department of Geology and Geophysics, Texas A&M University, College Station; A. Freed, Department of Earth and Atmospheric Sciences, Purdue University, West Lafayette, Ind. ; C. Marone, Department of Geosciences, Pennsylvania State University, University Park; and T. Tullis, Department of Earth, Environment and Planetary Sciences, Brown University, Providence, R.I.
Citation: Kronenberg, A., G. Hirth, N. Lapusta, J. Chester, A. Freed, C. Marone, and T. Tullis (2016), Laboratory sharing to improve rock deformation research, Eos, 97, doi:10.1029/2016EO063465. Published on 29 November 2016. A visiting postdoc prepares for a high-pressure experiment in Texas A&M’s John W. Handin Laboratory for Experimental Rock Deformation. The instrument pictured here is a triaxial Griggs deformation apparatus, which allows scientists to perform compression experiments at pressures and temperatures of the middle crust to upper mantle.